The Japanese House has released her long awaited debut album Good At Falling, via Dirty Hit. Produced by The Japanese House, BJ Burton (Low, Bon Iver, Francis and the Lights) and The 1975's George Daniel, Good At Falling follows four acclaimed EPs and includes the singles 'Lilo' and 'Maybe You're the Reason', as well as 'Follow My Girl' and 'We Talk all the Time'. In the run up to Good At Falling, The Japanese House (aka Amber Bain ) played a sold out show at the Scala, completed a twelve date European tour, and received acclaim from The Guardian, the Sunday Times, NME and more. Good At Falling began as demos recorded by Bain on her laptop in her room in London, and was finished in studios across Wisconsin, Brussels and Oxford, by Bain, BJ Burton and George Daniel. The result is an album that draws from Bain's life in a way her work never has before - a more personal, vulnerable and yet confident body of work. "These songs are definitely more direct" explains Bain, "the album has a lot more of me in it, so it makes sense". Listen To Good At Falling here. To celebrate the release of Good At Falling, The Japanese House yesterday shared the video for latest single 'Maybe You're the Reason', which sees Amber searching for answers amidst the shadows, pulling at the less optimistic threads from the glowing sad-pop anthem. Bain will also visit three Rough Trade stores across the country for live acoustic in store shows in celebration of the album. These intimate shows come ahead of her UK tour in March, including a night at London's Electric Ballroom. For more information visit http://thejapanesehouse.co.uk/live. 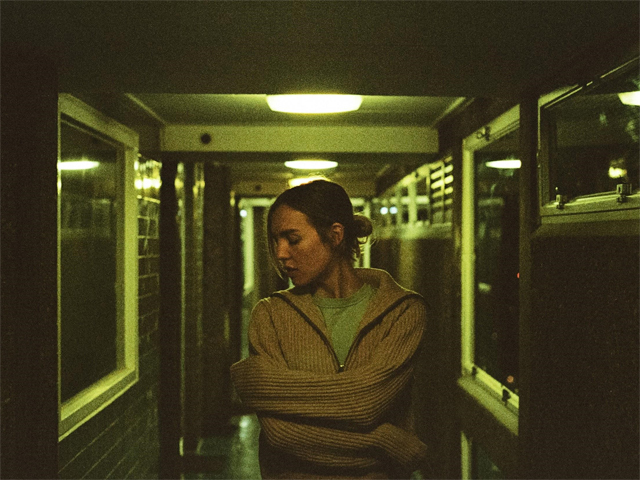 The Japanese House, otherwise known as Amber Bain, has to date released four acclaimed EPs with Dirty Hit: Pools To Bathe In (2015), Clean (2015), Swim Against The Tide (2016) and her latest release, 2017's Saw You In A Dream. With an "experimental and impressive" (DIY) sound adored by both critics and fans, Amber has played in arenas across the UK with label mates The 1975, taking in shows at the O2 Arena, and found herself landing a spot on the prestigious BBC Sound Of 2017 Longlist. With a raft of sold out headline shows under her belt, including nights at London venues Koko and Scala, "Bain's rise to the top appears imminent" (NME) as she returns to the UK for her March dates and releases her debut album.